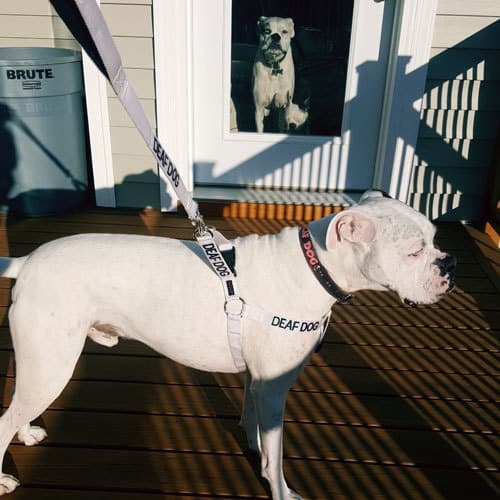 In March 2019, our Deaf Dogs Rock community sponsored 20 deaf dogs into the safe harbor of rescue so they can start on their new journey to finding their forever homes. Deaf Dogs Rock assisted in finding a special needs rescue for deaf dog Opal from Alpharetta GA. Thanks to Green Dogs Unleashed and to the entire Highway Heroes Transport Team for getting Opal from GA all the way to Virginia. We are happy to start working with The Deaf Bull Terrier Club of America Rescue because from time to time there will be a deaf BT in a shelter and it is challenging at times to find a rescue who is familiar with the Bull Terrier breed. So happy these three finally made it to Speak For The Unspoken in Ohio. We were worried about Spirit when the people who had him had another dog who kept attacking him. One of the photos he sent to us here at Deaf Dogs Rock his head was starting to swell so we reached out to Speak St. Louis since he was much closer to St. Louis. They worked with the caregiver to get them to take Spirit to the vet so he could be checked out. We offered sponsorship on Spirit, Pru and Zelda to get them into a special needs rescue so they would be safe. Speak St. Louis made sure the pups got to Speak Ohio where they had open deaf puppy foster homes available so each deaf dog will get the attention, vetting and training they need before they go to their forever homes. When Tanya with Poet’s Vision Aussie Rescue reached out to Deaf Dogs Rock asking for assistance we were happy to help. There were two deaf puppies in Quebec that needed to be rescued. Our Deaf Dogs Rock Rocker Puppy program was a perfect fit for the two little deaf puppies named Marla and Cassia so she can get the vetting she needs before she becomes available for adoption. Our Deaf Dogs Rock community who supports our mission to help one deaf dog at a time is responsible for helping Marla and Cassia get a DDR Rocker Puppy sponsorship so she can be well taken care of so thank you so much for your continued support. Thanks also to Tanya for stepping up to rescue these two sweet angels so they can start on their new journey to find a loving forever home. We has several people reach out to us to get help for deaf puppies (March is PUPPY month) and we reached out to Speak St. Louis who reached out to Speak For The Unspoken Ohio to see if they had room to take Jimmy, Chuck Norris (aka Lumpkin and Bumpkin) and deaf puppy Bunny. Thanks to Speak St. Louis for organization transportation to get these three to Speak For The Unspoken Ohio. It takes a team of rescue warrior women working together as a team to get these deaf puppies into the safe harbor of special needs rescue. 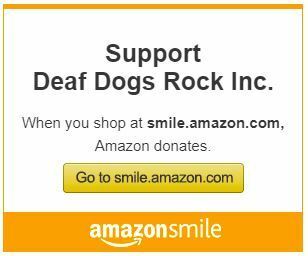 Thanks to our Deaf Dogs Rock community for supporting and donating to Deaf Dogs Rock so we can continue to sponsor deaf puppies like Jimmy, Chuck Norris and Bunny into rescue so they can start their journey to find new loving homes. When a person reached out to Deaf Dogs Rock for some help with a deaf puppy that was already passed on to person number four I knew we had to help out. We contacted Erika with Green Dogs Unleashed and she made arrangements to get the puppy from Raleigh NC to Troy VA. Thanks to our wonderful supporters we were able to sponsor Daisy into Green Dogs Unleashed rescue where she is in a loving experienced foster care home in Richmond, VA. Daisy will start her American Sign Language lessons, puppy lessons, start being socialized and also get fully vetted while loving homes are being screened for her. 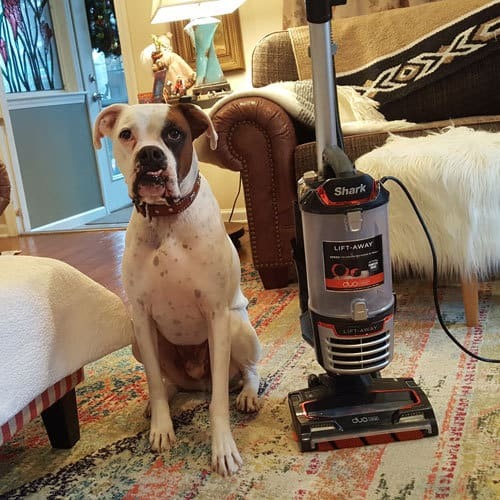 Thanks to everyone who donates to Deaf Dogs Rock so we can continue to help deaf puppies like sweet boxer mix Daisy. 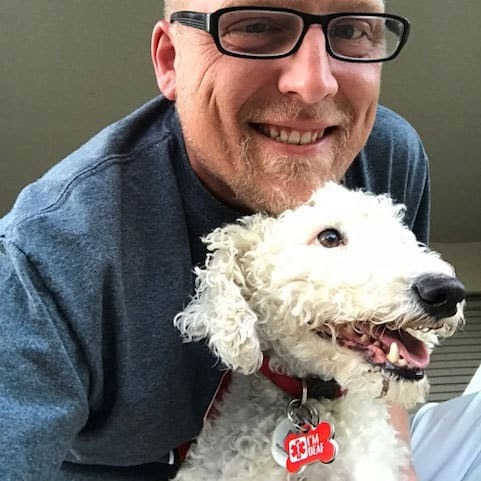 When Speak For The Unspoken asked us for help with three deaf puppy mill dogs we jumped at the chance to help because they have made room for so many deaf puppies who have needed help in the past in the Midwest. Because of our awesome community of supporters, Deaf Dogs Rock was able to send in sponsorship for deaf Double Merle puppies Larry, Curly and Moe so they can get the vetting they need before they are available for adoption. We got a plea for a deaf dog who desperately needed rescue from the Cumberland County shelter so Deaf Dogs Rock put out a rescue plea for a rescue to step up and pull Optima. Thanks to Whispers of our Forgotten Animal Rescue for not only pulling Optima but also finding the perfect home for Optima. When Poet’s Vision Aussie Rescue needed help with another deaf aussie puppy, our Deaf Dogs Rock community stepped up to sponsor little deaf puppy Argo so he can be vetted as soon as he gets to rescue. Thanks to our friends Keri and Hearther (and her mama) for helping to transport Jewel through SW Virginia to Troy, VA. You all ROCK! Thanks to our wonderful friends and donors Patricia and Vern for sponsoring deaf puppy through our Deaf Dogs Rock Rocker Puppy program. Thanks also to all the volunteer drivers with Highway Heroes Rescue Transport Team for continuing to help deaf puppies out of Texas get to special needs rescues like Green Dogs Unleashed here in Virginia. Our partner rescue in Katy Texas is Almost Home Pet Rescue who gets the deaf pups in Texas safely into foster homes, gets them vaccinated, gets their health certificates prior to transport and provides each puppy with a crate and supplies for a two day transport from Katy TX to Troy, VA. It takes a tribe of rescue warriors to come together to save one deaf puppy at a time. We put out a rescue plea with a sponsorship offer several months ago for deaf dog Dolly. We were very excited to hear from Trisha with Perfect Imperfections letting us know Dolly was on her way to them so Dolly is a recipient of our Deaf Dogs Rock Rocker Puppy sponsorship program which will help with her vetting costs when she gets into rescue. Thanks to our generous supporters who donate so we can continue to sponsor deaf dogs into the safe harbor of rescue. Thanks to all of you who host Facebook Birthday Fundraisers to celebrate your birthdays and raise money for Deaf Dogs Rock. To learn more about how you can host a DDR FB Birthday fundraiser, please click here.